Socialization of fire prevention and danger is given to the pilgrims of Jami Nurul Dholam Mosque, Jalan Pademangan Timur VII, RT 06/RW 10, Pademangan Timur Urban Village, Pademangan.
" 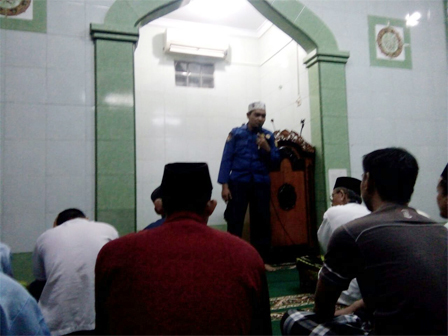 We encourage people who care and alert the fire hazard, especially during Ramadan"
Pademangan Sub-district's Fire and Rescue Handling Group Head, Heri Setiadi said it is conducted on the sidelines of tarawih prayers, Tuesday (5/22) night. "We encourage people who care and alert the fire hazard, especially during Ramadan," he stated, Wednesday (5/23). His side also has done various efforts to raise awareness of people against the fire disaster during Ramadan by spreading leaflets and installing banners in various locations. "Banners that we install are at RW 10 office and Pademangan Timur Urban Village office," he stated.